Walking over the snow-covered mountains a few days ago (see my last post) my thoughts turned to ski touring. There wasn't enough snow to make me wish I'd brought my skis, though I did see two others skiing (and one person carrying their skis) but there was enough to be exciting. Thinking of skiing was further encouraged via a message from Igloo Ed asking if I fancied a trip later in the season, maybe in the Colorado Rockies. I do indeed! Then today Andrew Skurka reposted a piece on his choice of ski gear (and I was interested to see he uses Asnes Nansen skis - I have a pair of the original version of these, dating from 1987!). It seems I'm not the only person thinking of ski touring. Below is a feature that appeared in the February issue of The Great Outdoors this year, illustrated with photos from previous ski tours. I hope to have new pictures from this season's tours soon. Ski touring, also known as backcountry skiing and, when summits are involved, ski mountaineering, is essentially hillwalking and backpacking on skis. 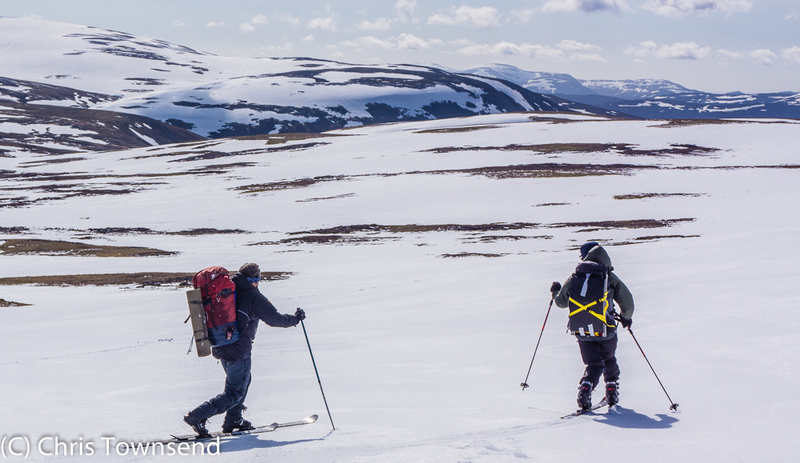 Travelling over snow-covered hills is much easier on skis than it is on foot, especially when the snow is deep. It’s also much more fun. Instead of slogging through the snow, sinking in with every step, you can glide over the surface. Being able to ski brings freedom to the winter hills. Ski touring covers everything from short trips on gentle terrain to long mountain ascents. Once you’re away from cut tracks and ski resorts then you’re ski touring. Where you can go and how far you can go depends on skill, fitness and, to some extent, equipment. 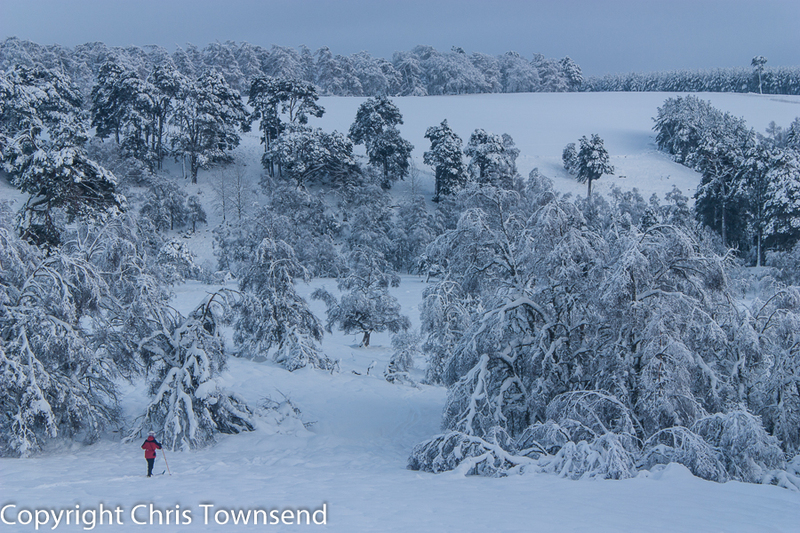 Even a short ski across local moors or through nearby woods is ski touring. Ski touring can be divided into two basic types: - free-heel and Alpine. In the first your heels are not fastened to the skis and boots flex at the forefoot so you can stride along, gliding on your skis. This is the best system for long tours on undulating terrain but doesn’t give the same downhill control as Alpine touring. Free-heel skiing gear can be divided into Nordic touring gear which is excellent on gentle terrain and rolling hills and heavier Telemark gear which is slower and harder work on the flat but better on longer and steeper downhill sections. Cross-country skiing gear is the lightest in the free-heel category but it’s designed for skiing in cut tracks and is only suitable for low level and gentle hills. I wouldn’t recommend it for most touring. As the name suggests Alpine ski touring involves similar gear to downhill Alpine skiing, that is rigid boots that are clamped to the ski at toe and heel. However Alpine touring bindings allow you to release the heel for skiing uphill and on flat terrain. You don’t have the same freedom of movement as with free-heel gear even with the heel released because of the inflexible boot soles though. However you will have more control skiing downhill, especially on very steep slopes. Alpine ski touring is often called ski mountaineering and it’s the type of touring for those who want to tackle big steep mountains on skis. If you’ve never skied before I recommend taking a course, as this is by far the best way to learn. You don’t need to be a proficient downhill skier to go ski touring though. Indeed, I think general winter mountain skills are far more important. And you need to know how to move efficiently on the flat and how to ski uphill. You’ll spend far more time doing these than you will skiing downhill. Ski touring can be as challenging as you want to make it. Shuffling over gentle terrain doesn’t require much skill and you can take the skis off and walk if you encounter terrain beyond your skills. This can soon become frustrating though. At the other extreme skiing down very steep mountains requires great skill. Most ski tourers will find a position that suits them between these two. However you don’t need to be a technically proficient skier to go ski touring even in the hills as long as you avoid the steepest slopes. Basic skiing skills are adequate. The main challenge of ski touring is the same as for winter hillwalking in fact – the ability to deal with weather and snow. 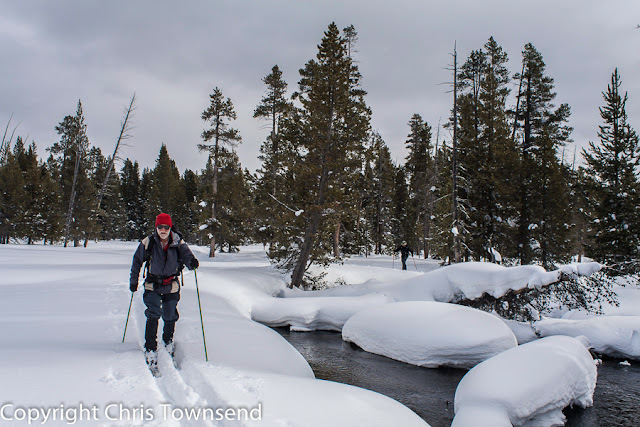 Fitness is important as ski touring is more demanding than walking if you want to glide rather than shuffle (though not more demanding than trudging through deep snow on foot). Any regular hill walker should be fit enough for ski touring however as long as you don’t try and do too much until your muscles are used to the different movements. Using trekking poles when walking greatly helps with ski touring. Before I used poles in summer my arms and shoulders used to ache on the first ski tours of the winter. Now I use poles year round this has stopped. The main risks with ski touring are the same as for winter hillwalking. 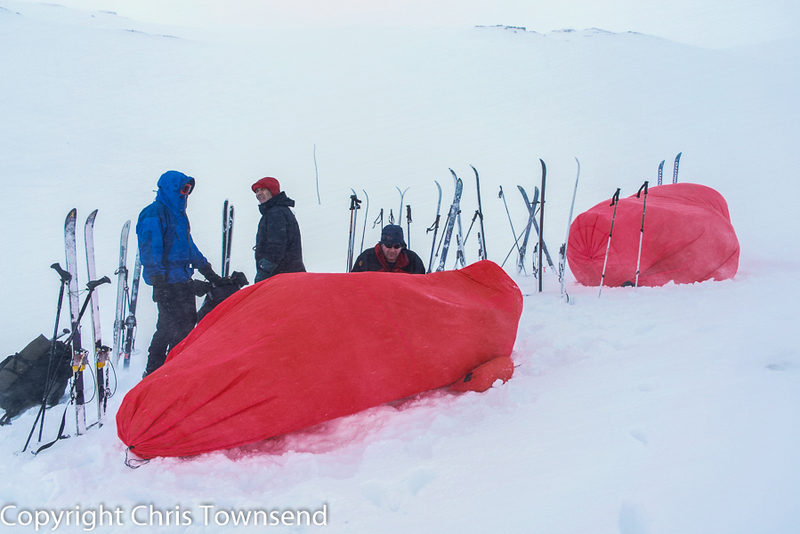 Ski tourers need to be able to navigate in blizzards, assess avalanche danger and cope with sub-zero temperatures. There may be times when ice axe and crampons are needed for safety rather than skis so you need the skills to use these. (Ultralight ones are available for ski touring). Because you can easily travel much further on skis than you would on foot care needs to be taken with timing so you don’t find yourself getting tired with far still to go or caught out in the dark (though if planned night-time skiing can be wonderful) or a storm. One skill that is different with skiing than walking is route-finding. The best walking routes often follow narrow ridges or traverse steep slopes that would be difficult and potentially dangerous on skis. Terrain needs to be viewed differently and assessed for ski rather than foot travel. Often broad ridges or valley bottoms make for the safest and easiest terrain. 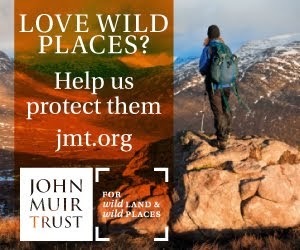 Summer walking routes, such as ones that zigzag up the back walls of corries, may cross dangerous avalanche terrain too. If in doubt find another route or turn back. The basic gear for ski touring consists of skis, bindings and ski boots. I’d add climbing skins (sticky strips of material that fasten to the base of the skis and stop them sliding back when you’re ascending) to this last as they make climbs much, much easier. 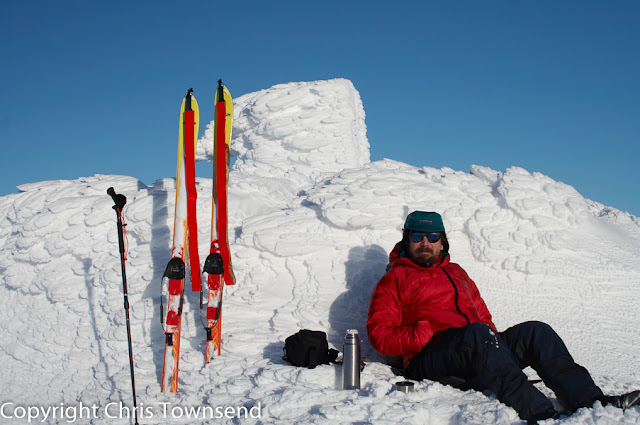 Cost depends on the type of ski touring. Roughly, Nordic touring gear costs from £500 upwards, Telemark gear from £800 and Alpine gear from £1000. These prices include skis, bindings, poles, boots and climbing skins. If you already have trekking poles these can be used – just get some wide snow baskets for them – saving £50-£100. These gear categories are not absolute. There is much overlap. The same skis are often used for Telemark and Alpine touring, the same boots and bindings for Nordic and Telemark. Buying from a shop specialising in ski touring gear that can give good advice is sensible. That way you can avoid the expensive mistake I made when I began – buying unsuitable gear that was all replaced within a few years. Alpine skis always come with a smooth base for fast gliding downhill. Skins are used on flat and uphill terrain. Some Nordic and Telemark skis come with patterns cut in the base that prevent the skis slipping back so you don’t need to use skins except on steep slopes. Waxless bases usually work okay but can’t be varied to suit the conditions. Better are skis with smooth bases to which you can apply grip waxes so you don’t need to use skins on flat and undulating terrain and short ascents. 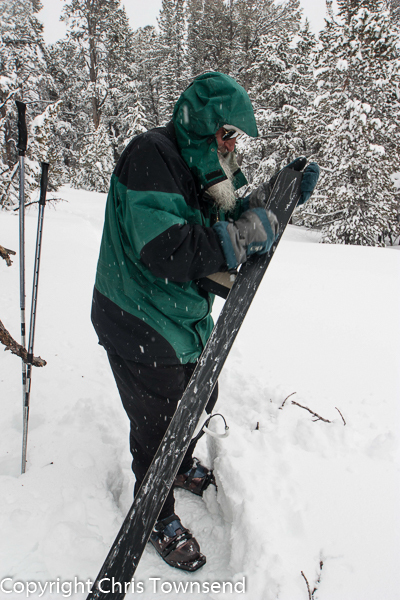 While very effective skins stop the skis from gliding and so are slow and hard work on gentle terrain. With the right wax the skis should glide easily without slipping backwards. A few hard waxes that cover a wide-range of temperatures are all that are needed. It doesn’t take long to learn basic waxing. You can wax alpine skis but they are almost flat without the spring in the middle of Nordic skis (known as camber) so the wax doesn’t last long and glide is limited. Because skis, poles and, especially, bindings can break or develop mechanical problems a repair kit with spare screws, a multi-tool and other items is worth putting together. A loose binding a long way from home can really slow you down. If going into avalanche terrain you need to think about avalanche safety gear such as transceivers. A snow shovel is often listed as avalanche gear. I carry one on every trip anyway as it has other uses such as building snow shelters and windbreaks. In Britain skis may have to be carried to the snow so a rucksack with side straps to attach them is useful. Rucksacks should be close-fitting and stable too. You don’t want to be thrown off-balance on a fast descent. Winter hillwalking clothing is fine for ski touring. Note though that skiing is often more energetic than skiing so over-heating is more likely. Don’t wear too much when on the move. 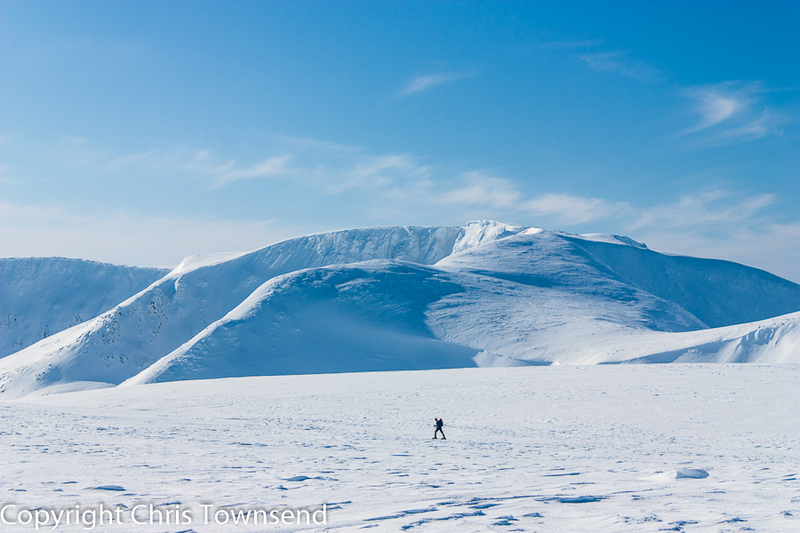 Ski touring can be done wherever there’s enough snow – I even skied down Skipton High Street once! However there are places where snow is more likely and where the terrain is more suitable. Rolling hills with wide open slopes and broad shoulders, ridges and plateaus are ideal, steep rocky hills are more challenging and often require more on-foot mountaineering and less skiing. Grassy and stony hills need less snow to make ski touring possible than ones covered in deep heather. 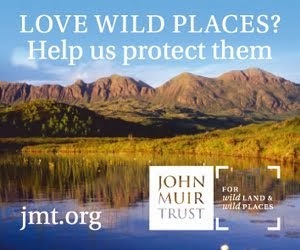 Broadly in Britain this means the best areas are the Eastern Lake District – Helvellyn and High Street ranges; the Pennines; Central and Southern Welsh hills – Plynlimon, Brecon Beacons, Black Mountains; the Southern Uplands; and the Central and Eastern Highlands – Creag Meagaidh, Monadh Liath, the Cairngorms. Of these the most reliable snow is found in the Cairngorms, unsurprisingly as it has by far the largest area of high ground in Britain – there hasn’t been a winter in the last 25 years when I haven’t been able to go ski touring here. How difficult a tour is depends on the snow and the steepness of the terrain. Breakable crust where your skis break through the surface of the snow makes any tour arduous. Icy terrain can make controlling your speed more difficult. Soft deep powder – rare in Britain – can enable you to descend steep slopes quite easily. In descent the angle of the slope is important too of course though there are techniques – traverse and kick turn, snow plough – that can allow any skier to descend challenging terrain. Here are five of my favourite ski tours and areas. In terms of technical difficulty these all come in the easy to moderate range. They all require good navigation and winter hillwalking skills. The crossing of the Cairngorm Plateau to Ben Macdui and back is one of the finest ski tours there is and one that takes you into really wild and remote country. It’s also my favourite tour and one I do at least once every year. Technically it’s not a difficult tour but the Plateau is exposed and navigation can be difficult if the mist comes down. The distance is around 17km with some 800 metres of ascent, depending on the exact route, and the trip takes 6-8 hours. The tour starts at the Cairngorm Mountain car park in Coire Cas (bus available from Aviemore) and climbs to the Plateau via the Fiacaill a’Choire Chais ridge. This often has cornices on the east and can be icy at the top – I’ve needed crampons occasionally – so care is needed. Once the Plateau is reached the skiing across the undulating terrain to Ben Macdui is wonderful with splendid views all around. 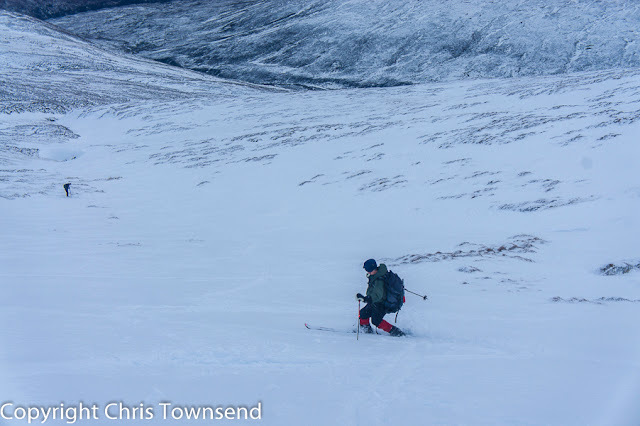 Return can be made across the western flanks of Cairn Lochan and then down Lurcher’s Gully, which holds the snow well and makes a great downhill run. The rolling boggy Monadh Liath hills are transformed by snow into an arctic landscape with vast views in every direction. 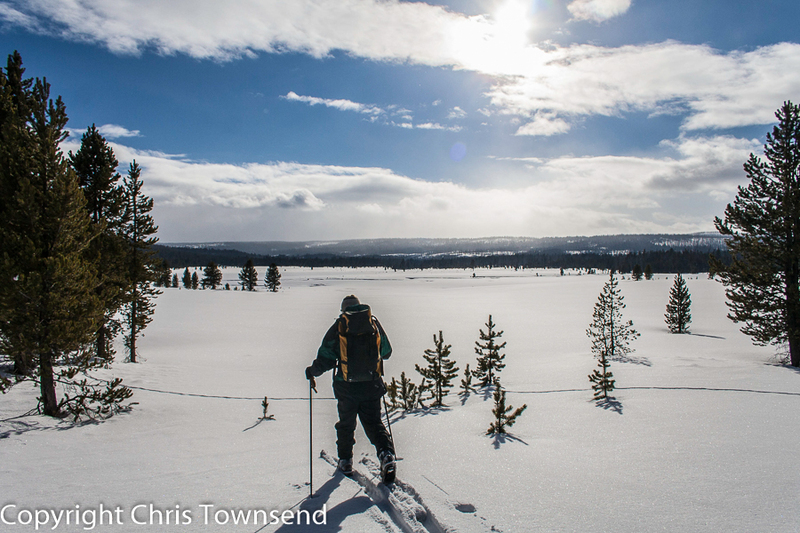 Traversing them on skis is easier than walking in summer as the bogs and tussocks that can be so wearying are buried. The three eastern Munros – A’Chailleach, Carn Sgulain and Carn Dearg - can be skied in one trip from Glen Banchor. The distance is quite long at around 25km and there’s over 1000 metres of ascent but the skiing is mostly easy – this is a tour for light Nordic gear that lets you swoop over the snowfields. The trip takes 8-9 hours. This big plateau-mountain in the heart of the Central Highlands is excellent ski touring country. The ascent of Creag Meagaidh can be combined with two adjacent Munros – Stob Poite Coire Ardair and Carn Liath – for a round of Coire Ardair from Aberarder. The distance is 18km and there’s over 1100 metres of ascent. I’d allow 8-9 hours. Much of the tour is above 900 metres so this is an exposed route. The views are tremendous and the long descent from Carn Liath almost all the way back to the start is superb. A great plateau mostly above 800 metres, the Moine Mhor – the Great Moss – offers a wide variety of ski tours. 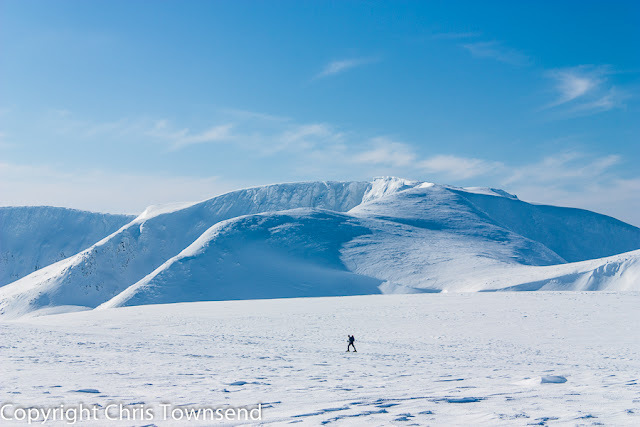 There are five Munros in the area but the real joy is being able to ski for miles across the vast snowfields with nothing but sky, snow and mountains all around. The rolling terrain is best suited to Nordic or light Telemark skis. The Moine Mhor is most easily accessed from Glen Feshie. One superb tour goes right across the plateau from Achlean in Glen Feshie to Monadh Mor, one of the Munros. 20kms long with over a 1000 metres of ascent this tour takes around 7-8 hours. A shorter route – 17kms with 750 metres of ascent - on the western edge of the Moine Mhor goes from Achlean to another Munro, Mullach Clach a’Bhlair. For a really long trip into more serious terrain with steeper slopes and bigger mountains the Moine Mhor can be crossed to Braeriach and Cairn Toul, a trip that gives fantastic views down into the Lairig Ghru and across to Ben Macdui. This is an outing that requires stamina and fitness – it’s 32kms long with 1400 metres of ascent and will take most skiers 10-12 hours. The White Mounth is the third great plateau of the Scottish Highlands. Bounded by Glenshee to the west, Deeside to the north and the Angus Glens to the east it’s a huge upland area containing 13 Munros including Lochnagar and Glas Maol. The possibilities for ski touring are many. One excellent tour goes from the Glenshee ski resort in the Cairnwell Pass over 5 Munros on the west side of the White Mounth- Glas Maol, Cairn of Claise, Tom Buidhe, Tolmount and Carn an Tuirc. This tour is 21km long with 1100 metres of ascent and takes around 7 hours. From Glen Doll on the other side of the White Mounth the two Munros of Mayar and Driesh can be skied along, again, with Tom Buidhe on a 23km tour that involves 1200km of ascent and takes 7-9 hours. On both these and other tours on the White Mounth once the initial climb is over and the plateau reached great distances can quickly be covered when the snow is good, making this another area for Nordic and light Telemark gear. Staying out overnight in the winter hills is a wonderful experience. Tents are good if you’re moving on every day, especially if you’ll be skiing long distances. However tents are not so good if you’re in one place for two or more nights, especially if it’s stormy. A snow shelter is much better, being roomy and weatherproof, and an igloo is the best form of snow shelter as you can build one wherever there’s enough snow. Igloos are light inside. Snow holes are dark and can only built on steep banks with deep snow. I’ve spent many nights in igloos and have built them in the Cairngorms and the Glen Affric hills. In an igloo you can’t even tell what the weather is doing outside. There’s ample space to sit and cook and stretch out. With an Icebox tool (www.grandshelters.com) two or three people can build an igloo in three or four hours. Once up an igloo will last as long as it stays cold and can be used again and again. Ski Mountaineering in Scotland by Donald Bennett & Bill Wallace (SMC). Out of print but well worth seeking out. 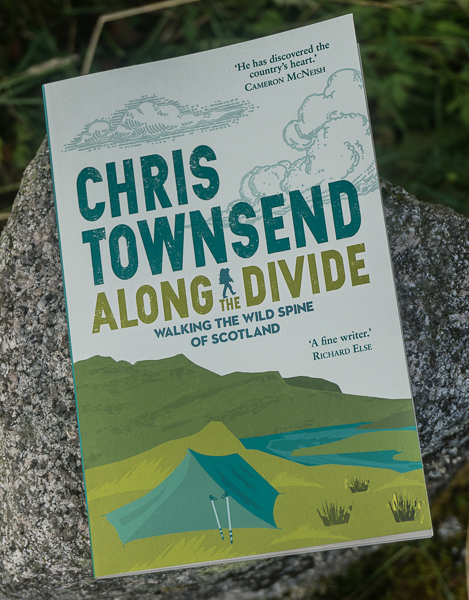 Ski Touring in Scotland by Angela Oakley (Cicerone). Out of print but well worth seeking out. Really enjoyed reading this, Chris. Took me back to the 80s when I first started touring with you in the Highlands. Many stories and memories! If the opportunity arises I would live to re-live some of those tours with you this winter, so keep us updated on the conditions. I'm out in the Alps for most of February but March and April are pretty free at the moment. Hope you get a ski tour in before too long! Yes, it would be great to redo some of those tours. Most of the snow has now gone so I won't be skiing for a while yet. Thanks for sharing that Chris. I can certainly recommend Mountain Spirit in Aviemore for hiring gear. Others may be hit and miss? as I hired some skis for a ski tour trip in Poland from elsewhere and the skis were not conditioned, which made the trip arduous whilst my Polish friend glided effortlessly. I think I'll buy gear for a possible next trip to Poland. My Polish friend took me to some wonderful winter wonderland hills there, well away from the crowds, with good public transport/facilities etc. Rabka Zdroj is a great place to ski, with the shepherds' huts left open for making a brew. Cold though!! -8c. I even felt like an explorer as Tomasz said "you are probably the first Englishman to ski through these forests", although his humour is legendary. Great photos Chris and inspirational. Thanks Jay. Sorry to hear about the poor skis. Mountain Spirit is certainly excellent. I've never thought of Poland for skiing. Sounds great.